Ever wonder why people fall asleep in church?It happens. We've all seen it. We shuffle into rows of seats that grow more comfortable with every new fundraising campaign. We slouch down and settle in for an hour or so, as singers and storytellers and preachers and teachers take their turns filling our ears. And almost without fail, at least one of us nods off while listening to the greatest story ever told.The church was not meant to be like this. The church was meant to be on its feet, in the world, making all things new. The church was meant to be sent.Kim Hammond and Darren Cronshaw want to help us-all of us-rediscover our sentness.Dive into Sentness, and explore the six postures of a church that's keeping pace with God's work in the world. Rediscover the gospel that first quickened your pulse and got you up on your feet, ready to go wherever Jesus called you. Get Sentness, and prepare to get sent. 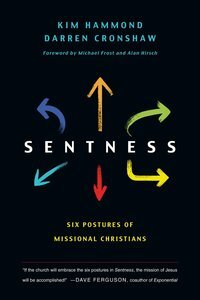 About "Sentness: Six Postures of Missional Christians"